Financial stress is on the rise as more and more families find maintaining a yearly salary to cover cost of living difficult. Finding the money to pay your regular monthly bills probably seems hard enough without worrying about putting money into savings. While years ago many parents were able to invest for their child’s future, most millennial parents simply feel that they can’t find the means to invest for their children. While you want to give your child everything, it’s important to find a balance. Can you afford to invest in your child’s future and still worry about your own? You’ve taken out a college loan, but can you afford to take out a retirement loan? Before you jump into the world of investing for your child’s future, make sure your plans work for your own future goals as well. It is normal for parents to want to do anything for their children. But the truth is that you aren’t doing your kids any favors if you don’t plan for your own future. The great news is that there are ways to prioritize yourself, keep up with your current finances, and plan for your child’s future. Here’s how! If your goal is to save for your child’s college, the most popular option is a 529 college savings plan. These plans are set in place for higher-education expenses and must be specifically used to fund those or K-12 private school expenses. The benefits of 529 plans are great but it’s important to know that once invested, these funds must be used for these educational needs. 529 plans are state-sponsored. They allow for tax-free growth and distributions and can be added to by friends and family wishing to help your children by building the future financial funds when they are young. While using the 529 plan for anything but education costs can result in tax fees and a 10% penalty fee, these funds can be transferred to another family member if your child doesn’t need it for school. Pre-paid tuition plans are another great option for college savings plans. An amazing advantage is that they lock in the costs of college tuition. Since we don’t know what way things may go in the financial future of education, pre-paid tuitions can actually save you money. One important point to remember when it comes to college savings plans is that it may hurt your child’s chances to obtain financial-aid or scholarships in the future. Custodial accounts are brokerage accounts that must be opened in your child’s name. They are not required to be used for educational reasons but you cannot get money out of them when you put it in. The most popular custodial accounts are Uniform Gifts to Minors Act Accounts, known as UGMAs, and Uniform Transfers to Minor Act accounts, known as UTMAs. They both have no contribution limits but are subject to Kiddies Taxes and will be listed on income tax returns. Trusts should be reserved if you have a considerable amount of money to invest for your child. They should be considered if you want to save a large sum of money and put it aside for your child. If you choose a trust, you should always meet with an attorney and talk to a tax advisor first. Your attorney will draft all necessary documents needed to ensure the trust is distributed according to your wishes. Your tax advisor will consult with you over all tax considerations before you make the investment. Trusts give parents control over their children’s money by allowing flexible decisions to be made as to time of distribution and circumstances. While you should definitely be sure you have the right investments in place for your financial future with your retirement accounts, it is never too early to start saving for your child’s future. The earlier the better! And believe it or not, you can start planning for your child’s retirement even if they are just a teenager. Talk to your financial advisor about a Roth IRA. As long as its only contributions put into these accounts, withdrawals can be done tax free if they are not earnings. As soon as your child gets their own job, they can begin contributing to their Roth IRA. If you find yourself stressed about being able to save for your child’s future, don’t be too hard on yourself. 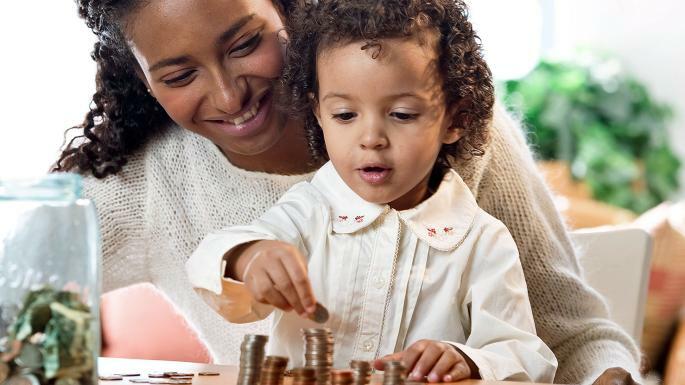 Above are some great options to help lock in savings for your children, but there are also options if you can’t afford to put aside anything at all. Educating your child is the best investment you can make when it comes to their future. Financial literacy is the give that keeps on giving. It is a subject they won’t learn in school but something you can teach them. Educate your children on budgeting, financial planning, and building their future goals. Even if it seems your children are too young to learn about money handling, there are great lessons that can be taught from grocery store games at a young age. Make believe grocery store games can teach your children how to understand the cost of things, how to budget, and how to handle their finances as they grow. Investing in your child’s financial future can give you a sense of pride knowing you’ve helped your children long beyond your years of raising them. While putting aside money can be helpful, it’s the overall commitment to teaching your children about their future finances that can be the best help of all. When you create a solid foundation for your child’s financial future, and prepare them to make the right decisions as they go off on their own, you will get the most of your money and help your child become a successful adult.